It's part Tetris. 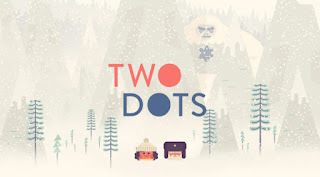 It's part.....I can't remember the name of the other game I had that also had coloured dots. ...and it's kind of fun. Two Dots is the name. Mind you, at first, my thought was "lame". But for moi, there is a problem-solving aspect and an OCD one too. Those play right into my wheelhouse. It took me a little while - though not horrendously so - to catch on to the game. I suppose most of that is because I'm a guy and don't read the directions. Or the prompts. Or the hints. So usually I fail the level with which I'm working a time or two before I catch on as to the goal. After that, it's mostly cake. 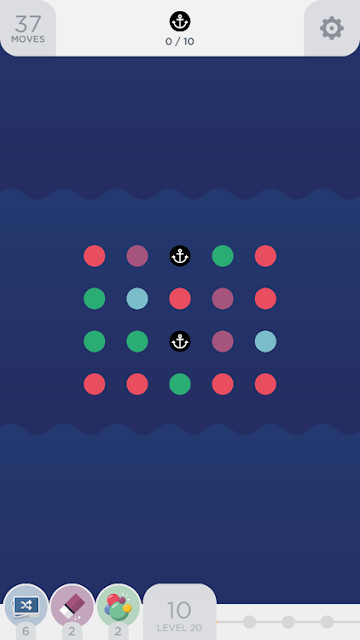 Like in this level, I must get 10 anchors to fall off the bottom of the screen, which means removing other dots. But you can see I cannot connect any same coloured dots And you have to do it in so many moves. This one was like 40 moves., which is seemingly high. Usually the amount of moves is less than 20.....or even 10. And unlike many a game via an app, there are a lot of levels. I'm already up to 27. I don't know how high they go. But unlike a lot of games I have downloaded, this one tries to get you to purchase 'boosters' or extra turns. So with every failed level, you get a prompt to buy something. Annoying. As you all know how cheap I am, that is SO not happening. I just keep playing the level until I win. Buying seems like taking performance enhancing drugs. I got sucked into a purchase, realized I'd just hit a danger zone and deleted the app.